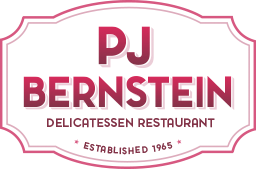 PJ Bernstein opened the 3rd Avenue Deli in 1965 and customers spread the wildfire word about corned beef and matzoh ball soup tasting just like food made by a million or more Jewish mothers. That free advertising eventually made the classic NY Deli famous even beyond the Upper East Side. Back then, the take-out business was a small operation, welcome, but sometimes difficult to package. Fact is, the deli now delivers food 13 hours a day to businesses and homes within the region, AND each month that goes by the online ordering business grabs a larger percentage of the delivery business that once was all telephone all the time. There’s never a busy signal online (unless you’re swiping the neighbor’s bandwidth) and GPS technology means the delivery server will find your location with ease. Of course, phone orders are welcome (212-879-0914) and the increasing delivery business is handled by an efficient operation with modern packaging to keep oomph in the herring and snap in the pickles. What can you order online? We got you. Just enter your email below and we'll send you a link to get in.